Reports on attacks of splashing acid on the faces of women and girls in Iran, particularly in Isfahan, by gangs affiliated to the Iranian regime in the past week, again proves the depth to the misogynist nature of the mullahs’ ruling Iran and their antagonism to women. This is a regime which has, from the onset of its reign, built its foundations on repression, particularly of women and was the one to come forth with the slogan of “Or wear the veil, or get beaten”. It has ruled the society by establishing a fundamentalist culture. Also parallel to this, it has carried out crimes, particularly against women that do not exist anywhere else. Truly, the Iranian regime is the epicenter of a fundamentalist and fanatical Islam. The heads of the regime have created various suppressive bodies under the name of combating “mal-veiling” which is cleric’s made name to prevent the outburst of popular protests, particularly women and has increased supression and a climate of fear. Theses days, they have tried to legalize their supressive measures. They have organized their fanatical and medieval laws so that their repressive agents and gangs can freely carry out such crimes. For example, the recent bill that has been presented in the mullahs’ Majlis (parliament) and parts of it which have been ratified under the name of “supporting the promotion of virtue and the prevention of vice” has in reality lead to the recent acid attacks and any forms of discrimination and harassment agaisnt women. Article 2 of this law declares: “promoting virtue, invites and leads others to virtue / prohibiting, is stopping vice.” However, it is obvious when a law is so unclear and undefined, its prime goal is to impose repression under the name of law. Who defines what makes virtue and what consists of defining vice and what would mean to promote and to prohibite and what are the requirements for this? In the mullahs’ regime’s culture, the misogynist agents can carry out any crime and this is how they define their laws. The widespread demonstrations and protests by women and youth these days against the dirty and criminal act of acid attacks, despite the repression and arrests proves once again that the mullahs’ and their repressive forces cannot easily implement their misogynist policies into Iran’s society. The Iranian people’s spirit of resistance and steadfastness against the clerical regime is a vivid example of the resistance and steadfastness found in members of the Iranian opposition, particularly the thousand women. This is a phenomenon that is an inspiration which strengthens resistance throughout the whole society, especially for freedom-loving women of our nation. Now, what is very dirty and saddening, is the silence of many Western countries vis-à-vis such horrendous crimes. The best of this is general verbal but weak condemnations, satisfying leaders. Such a policy encourages the regime to carry on with their crimes against the Iranian people, particularly women and to increase their fundamentalism in the region. 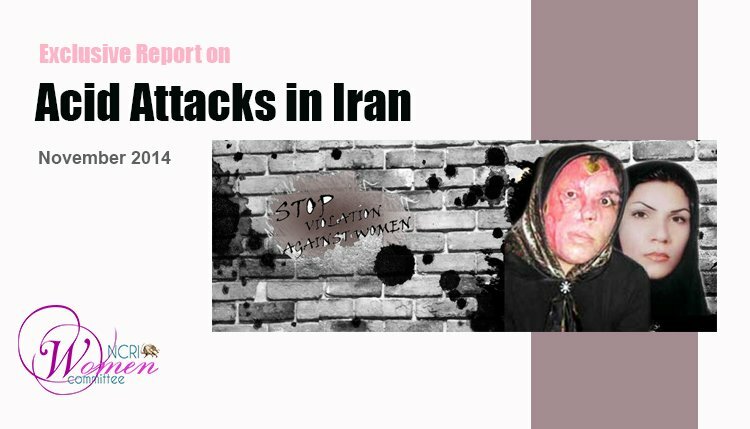 Below, is report by the NCRI Women’s Committee on the terrible crimes committed by the mullahs’ against Iranian women. The clerics ruling Iran have identified misogyny as the slogan for their programs and goals and use the repression of women as the most important instrument to impose oppression on the society. They consider mandatory hijab as a tool to limit and control women as women’s freedom is considered as the end of their rule. Therefore, women’s dress code is considered a security issue. This is seen in remarks made by senior regime officials that Iranian women not giving in to constraints, have made these pre-historic demons, so vicious. However, the first mandatory law on hijab that is fully implemented in Iran today was not enough for regime’s officials. They are seeking to impose a law by the name of “Expanding the Culture of Virtue and Hijab” which was passed in 2005 but never implemented. According to this law, the obligations of almost 20 organizations and governmental bodies were defined to impose mandatory hijab and finally in April 2010 it became executable under an interior ministry deputy. Considering that the regime is continuously faced with opposition from freedom-loving Iranian women and youths on the implementation of this law, it thinks of intensifying its intentions by implementing a law called “Supporting Agents of Promoting Virtue and Prohibiting Vice”. The plan, consisting of 24 articles, was passed on 8 October 2014 by the regime’s Majlis. One of the articles calls on the State Security Forces (SSF) to obligate women ‘lacking sharia hijab’ (as described by Majlis members) to take part in training courses and also fine them 2 to 10 million rials. The misogynist laws have a large amount of unwritten and unannounced points. In mid-October, news on the wave of horrific acid attacks on women was published in the media. The first round of barbaric attacks was carried out against 6 women in Isfahan. All were hospitalized in this city’s Feiz Hospital. One of the victims, a 21-year old woman who had acid thrown to her face, entered her mouth, burning her internal organs. Eyewitnesses said the common characteristic of all the victims were women who were young, beautiful and did not dress in chador. On October 19, 2014, three more young girls were victims of the mullahs’criminal acid-attacking gangs in Isfahan. A two-man team on a motorcycle splashed acid on three young women on Sheikh Avenue. One of the victims lost her life as acid was entered her chest and the two others were taken to a hospital. The number of acid attack victims reached 14 to that day. However, with the news received from other cities, the victims quickly increased to 25 cases, 15 of which were in the city of Isfahan. The crime did not stop here. On October 24, 2014 a young women in Gohardasht Prison of Karaj was attacked with acid. On the same day, another woman was victimized by acid that burnt her face in Isfahan. 24-year old Fereshteh was the next victim of the acid splashing which was carried out in MalakShahr Intersection of this city. The attack was carried out by three individuals on motorcycles who had covered their faces. Eyewitnesses identified one of these individuals as a member of the local IRGC Basij forces. The next night, agents on motorcycle splashed acid on the face of a middle-aged woman inside a vehicle opposite of Tehran’s Tohid metro. More than half of the victim’s face was burnt as a result of the acid attack. In the regime’s in-faction fighting, state-run ISNA news agency reported on October 21, 2014 that 8 men and women were attacked with acid at a bus station and later taken to a hospital two months ago in Kermanshah. Hoodlums linked to the regime splashed acid on another woman and easily left the scene in Isfahan’s Apadna region. The mullahs’ MOIS agents carried the body of the injured lady and warned local storeowners not to report the incident anywhere. The regime’s officials and media outlets had attempted to prevent the publication of news in this regard from day one. 27-year-old Soheila described these events while her entire body was dressed and she could hardly talk. If her left eye doesn’t become infected and her surgery is successful, she will have 20% of her vision but she is completely blind in her right eye. – State-run ISNA news agency, 29 October 2014 – While attempts were made to describe the reason behind the acid attacks as family feuds, reports came of Tahmineh Yousefi, 29, as the next victim. To this day many surgeries have been carried out on her face. Despite the regime’s attempts to portray the horrific crimes as individual and social cases, through its incomplete reports, all the rushed remarks made by the regime’s officials – and their internal disputes – clearly indicate that the regime itself is behind the entire incident. – State-run Tasnim news agency, 26 October 2014: Former Majlis member Zohreh Elahian described associating acid attacks to agents of ‘Promoting Virtue and Prohibiting Vice’ as the West’s fear of women’s hijab. State-run Sharqdail, 22 October 2014: After the acid attacks the samples of the remaining acids on the clothes and vehicles of the victims were examined and proven the acids were similar. The type and depth of the wounds left on the women also confirm this. The acid attack crimes received strong international condemnation. The Iranian regime’s officials have become terrified and they have tried to whitewash the attacks. The main stance against the inhuman attacks was taken by women and the Iranian people. On October 22, 2014, protest rallies were staged in Tehran and Isfahan. Demonstrators in these protest chanted “Death to Iranian ISIS”, “You worse than ISIS, you splash acid on us?”, “Death to acid attacker”, “No to mandatory hijab”, “With or without hijab, no to acid attacks”, “Women’s share of security? Acid attacks, crimes”, “Anti-women laws must be annulled”, “No fear, no fear, we all stand together.” Participants in these rallies were attacked by repressive forces using to batons and bird shots. They detained over 50 youths and transferred them to unknown locations. The arrest of a woman protester in Tehran raised extreme anger and chanting against the mullahs’ regime, with protesters demanding her release. Following the protests, people in Isfahan called for widespread strikes in universities, schools, offices and the Bazaar on Saturday, October 25, 2014. Similar calls were posted on social media Tehran and other cities. These protests took place in different cities based on previously announced programs. Large crowds, especially the youths in Isfahan, rallied at the Dolat Gate and Sepah Avenue, protesting acid attacks by the mullahs’ gangs against women. Repressive forces, including the Special Anti-Riot Unit, used tear gas to raid on the youth. Repressive State Security Forces and plainclothes agents were stationed in Imam Hossein Square opposite of the municipality building, calling on the people to limit their commuting throughout the city. In Tehran a number of students in Enghelab Square chanted “Perpetrators of this vicious crime must be punished” and protested the execution of Reyhaneh Jabbari and acid attacks against women in Isfahan. During the rally SSF forces used black vehicles to attack students and arrested a number of students. Rallies protesting acid attacks also took part in the city of Mashhad where a number of women and youths rallied in Mellat Park located on Imamat Avenue. The protesters were beaten by repressive agents some of the protesters were detained. The people of Saghez in Kurdistan Province joined the anti-acid attack rallies. A large crowd gathered near the regime’s governorate office and chanted “Death to Dictator” while clashing with repressive SSF agents. Over one hundred young women gathered in Tehran’s Enghelab Square to protest the acid attacks by criminals linked to the mullahs’ leader Khamenei on Ocotber 26, 2014. Fearing the spread of this demonstration State Security Forces closed off roads leading to this square. On this same day, a group of students in Babol’s Noshirvani University boycotted their classes and gathered at the campus, protesting criminal measures of acid attacks on the head and faces of Isfahan women and girls. A number of students delivered speeches condemning the hideous crimes. The students also held placards written, “Security, freedom are our indisputable rights” and “Street security is our indisputable right”. Similar protests were carried out by students of Alameh Tabatabai University. In their final statement they condemned violence against women and protesters called for the perpetrators of the crimes to be convicted. Students of Shahroud University rallied on October 28, 2014 to condemn the horrendous acid attacks. They chanted, “Acid attackers must be punished”. Following the wave of condemnations and protests, the mullahs’ regime has gradually changed its remarks and by now, is attempting to whitewash their image. – State-run Tabnak website, 27 October 2014: Ahmad Mohammadi, director of the Imam Mousa Kazem Burn Accident Hospital said three individuals have been hospitalized in this facility due to acid attacks this year; two individuals hospitalized are recent victims and a man was hospitalized in this center earlier because of an acid attack. He said family matters are the main reason behind acid attacks. “There have been cases in the industries. In the past two or three days there have been no new cases of acid attacks reported or brought to this hospital,” he said. “Currently there is no concern of security around Isfahan Province and the best measures possible have been taken to confront the subject of acid attacks,” Mohammadi added. It is crystal clear that the unrestrained viciousness of government gangs against Iranian women, leaving new incurable wounds on their souls and bodies, is the final and firm result of creating a climate of fear and silence for Iranian women and the people in general in order for the mullahs’ regime to continue their dark rule. However, the steadfast people in Iran will not succumb to such repressive laws and will continue to pay the price for freedom and democracy. Iran: 318 acid attacks this year and no arrests!